The Global Volcanism Program has no activity reports for Iskut-Unuk River Cones. The Global Volcanism Program has no Weekly Reports available for Iskut-Unuk River Cones. The Global Volcanism Program has no Bulletin Reports available for Iskut-Unuk River Cones. 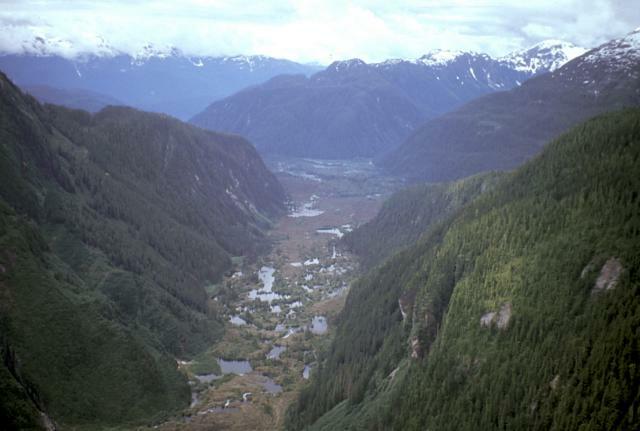 Eight small basaltic centers at the southern end of the Stikine volcanic belt near the Alaska border comprise the Iskut-Unuk River Cones group. Lava flows date back 70,000 years, but the subaerial vents produced cinder cones and lava flows that were probably all active between about 9,000 and a few hundred years ago. Five of the centers produced lava flows that traveled up to ~20 km down the Iskut and Unuk River valleys and their tributaries. The three remaining centers are products of ice-contact volcanism that formed pillow lava, hyaloclastite breccias, and scoria. The flows are similar in mineralogy and contain abundant crustal xenoliths. Vents in the Iskut River Canyon area produced at least 10 lava flows, and the Lava Fork vents at least three lava flows, the latest of which erupted within the past few hundred years. Elliott R L, Koch R D, Robinson S W, 1981. Age of basalt flows in the Blue River valley, Bradfield Canal quadrangle. U S Geol Surv Circ, 823-B: 115-116. Grove E W, 1976. Deglaciation a possible triggering mechanism for recent volcanism. In: Gonzalez-Ferran O (ed) Proc Symp Andean & Antarctic Volcanology Problems (Santiago, Chile, Sept 1974), Rome: IAVCEI, p 88-97. Hauksdottir S, Enegren E G, Russell J K, 1994. Recent basaltic volcanism in the Iskut-Unuk rivers area, northwestern British Columbia. Geol Surv Can Pap, 94-1A: 57-67. Souther J G, 1977. Volcanism and tectonic environments in the Canadian Cordillera, a second look. Geol Assoc Can Spec Pap, 16: 3-24. Stasiuk M V, Russell J K, 1990. Quaternary volcanic rocks of the Iskut River region, northwestern British Columbia. Geol Surv Can Pap, 90-1E: 153-157. Wright F E, 1906. Unuk River mining region. Ann Rpt Ministry Mines, Brit Columbia (1905), p 68-74. There is no Deformation History data available for Iskut-Unuk River Cones. There is no Emissions History data available for Iskut-Unuk River Cones. Shallow ponds dot the surface of valley-filling lava flows of the Iskut-Unuk volcanic field. The flows traveled south 5 km where they crossed the border into Alaska and dammed the Blue River, forming several small lakes and traveling a total of approximately 22 km. The Iskut-Unuk River Cone Group consists of eight small basaltic centers at the southern end of the Stikine volcanic belt that range in age from about 70,000 to only a few hundred years old and form one of the youngest volcanic fields in Canada. Photo by Ben Edwards, 1997 (Dickinson College, Pennsylvania). There are no samples for Iskut-Unuk River Cones in the Smithsonian's NMNH Department of Mineral Sciences Rock and Ore collection. Large Eruptions of Iskut-Unuk River Cones Information about large Quaternary eruptions (VEI >= 4) is cataloged in the Large Magnitude Explosive Volcanic Eruptions (LaMEVE) database of the Volcano Global Risk Identification and Analysis Project (VOGRIPA).